A short article regarding iron deficiency anemia was recently published on the New England Journal of Medicine blog. The thing that immediately caught my attention was this beautiful image of iron homeostasis. Iron deficiency anemia is the most common anemia worldwide so it’s definitely something to be familar with. See the article here. Here are 3 of the best videos covering implantation during the first 2 weeks of embryogenesis. Pretty remarkable stuff. Enjoy! It may be “old school”, but this is still probably one of the best embryology videos out there. Watch it with your notes, textbook or review book in hand as an additional guide and it definitely makes things much clearer. Always worth going back for review if you’ve seen it before too! What is a superantigen and how do they work? See this video for an excellent explanation of superantigens and the sequence of events they induce. A prototypical example of a superantigen is toxic shock syndrome toxin (TSST) released by S. aureus. I remember when I used to get all the different parts of the sarcomere mixed up, but with a few simple tricks you can remember it easy and long-term. First, understand the the I band is isotropic and the A band is anisotropic. Although these terms technically refer to the behavior of polarized light passing through, I like to think of isotropic = moving and anisotropic = non-moving (remember that “an-“ means “without”). So how do you remember which is the thick filament and which is the thin filament? Just remember that the heavier something is, the less likely it’ll move! In other words, think of the thick filaments as too heavy to move which means they’re the A bands because “an-“ (or “a” if that’s easier for you) means “without”. By default, the thin filament will be the I band. Additionally, the letter “I” is thinner than the letter “A” so it’s gotta be the “thin” filament right? Now Z lines are you endpoints which should be easy to remember, because the letter “Z” is at the end of the alphabet. This actually ties into the next point too. The points that “move” during muscle contraction are the H band and I band which spell “HI”. In other words, the “HI” bands bring the ends of the sarcomere (Z lines) closer together so they can say “Hi”! Obviously this doesn’t cover everything you should know about the sarcomere and muscle contraction, but hopefully it helps get you started if you were having trouble! Background: Paroxysmal nocturnal hemoglobinuria is a rare, chronic condition in which patients experience breakdown of red blood cells (RBCs) which releases hemoglobin into the blood. This hemoglobin is then filtered into the kidneys and causes the patient to have dark-colored urine. Although patients can experience hemoglobinuria after a full nights sleep, this isn’t always the case, so the name is somewhat of a misnomer. The idea behind this process occurring mainly at night is that people have altered breathing patterns when sleeping which causes the blood to become more acidic. 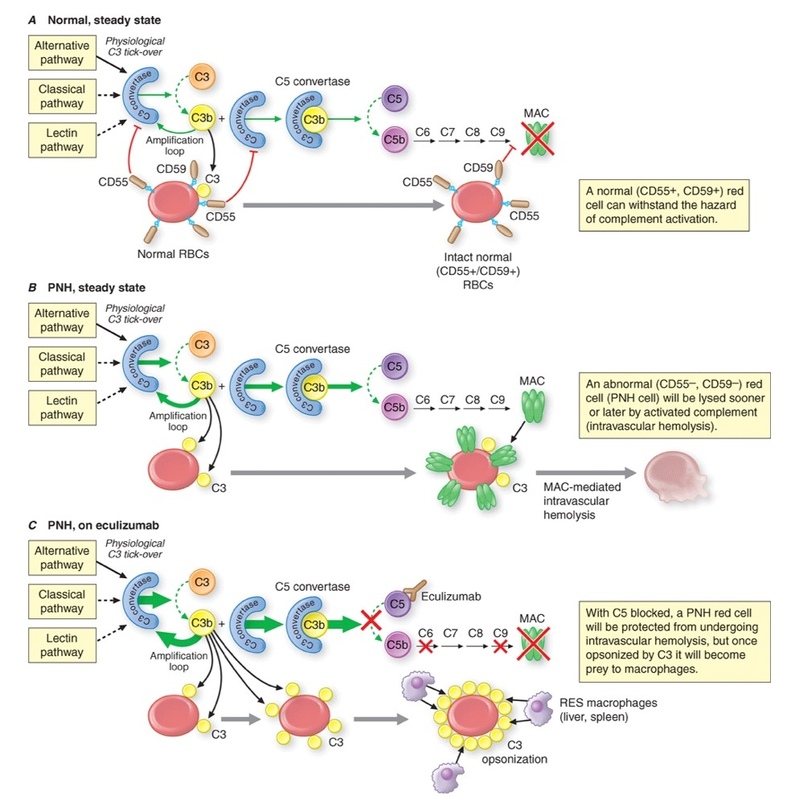 The acidic environment activates the complement system which goes on to cause hemolysis of RBCs. However, more recent studies have shown that hemolysis actually occurs anytime throughout the day and the urine just becomes more concentrated at night. Thus, it often appears darkest in the morning because of it being in a concentrated state. 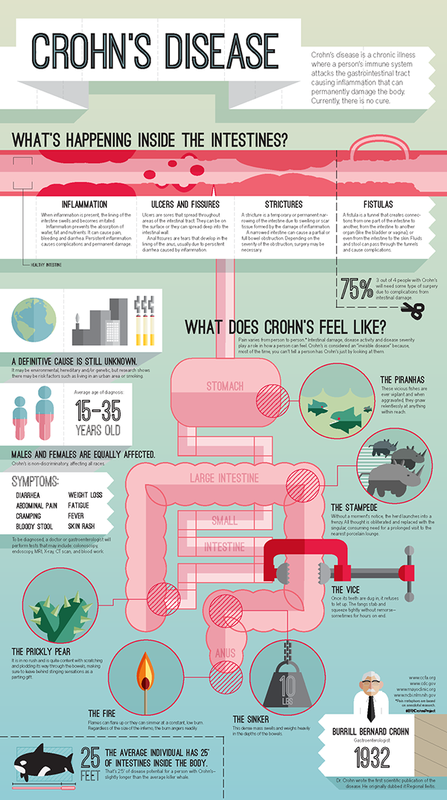 Pathogenesis: I actually really like the image shown below for a visual explanation of the condition. Basically, patients with PNH lack the glycosyl-phosphotidylinositol (GPI) protein that functions as an anchor for CD55 (decay-accelerating factor or DAF) and CD59 (membrane inhibitor of reactive lysis or MIRL). This is due to an X-linked mutation on the PIGA gene. As a result, cells can’t “hold on” to the CD55 and CD59 proteins. Think of CD55 and CD59 as identification tags for the cells; without them, the cells can’t prove they belong! The complement system comes along and sees someone without proper identification, so it decides to do something about it. Thus, it attacks the “foreign” red blood cells which results in hemolysis and the release of hemoglobin. At first, a molecule called haptoglobin can go around and “sweep up” the hemoglobin. It’s like a specialized janitor for hemoglobin. Over time the janitors are all busy so the hemoglobin starts to accumulate in the blood and gets filtered into the urine for excretion. Treatment: Also shown in the diagram, you can see that eculizumab blocks C5 which prevents formation of the membrane attack complex (MAC). As a result, there is decreased hemolysis of the RBCs. However, opsonization by C3b can still occur so that macrophages will eventually take care of business. Additional Information: Hemolytic episodes can also be precipitated by drugs, trauma, infection etc. The most common cause of death in these patients is venous thrombosis. However, the thrombophilia present with PNH is not fully understood. Plasma hemoglobin can consume nitric oxide (NO) which is important for inhibiting platelet aggregation. Thus, one hypothesis is that the the reduction in NO causes increased clot formation. Patients are also at an increased risk of developing aplastic anemia. Awesome EKG & Arrhythmia Playlist by Khan Academy Medicine! This is probably one of my favorite video series on cardiac arrhythmias. I haven’t watched all the videos yet, but the ones I’ve completed have been great! The EKG video is also a nice introduction to the physiology behind EKG tracings if you need some help understanding that as well. This is definitely a great resource for anyone studying electrophysiology of the heart, so be sure to check it out! In addition, I’ve added one of my favorite action potential images that can be found through Google. It’s an excellent visual representation of how each area of the heart contributes to the overall EKG tracing. Enjoy! Please go check out the latest Medical Minded podcast episode Heart Murmurs – MS, MR, MVP, AS and AR. This podcast is an expansion on the concepts presented in the Introduction to Heart Sounds episode, so make sure if checked it out if you haven’t already. In this latest episodes I discuss mitral stenosis, mitral regurgitation, mitral valve prolapse, aortic stenosis and aortic regurgitation. If you plan on only learning the basics of heart murmurs, these are the 5 you need to know! Also, if there is one thing that I can’t reiterate enough about learning this stuff it’s to develop an understanding of the underlying concepts. If you learn the basic principles, the heart sounds will make sense. You should be able to work out why each sound happens if you truly understand the material. Remember, you need a solid foundation to build a house! Have you ever read through your textbook, highlighted “important” information, and then reviewed your highlights to study for an exam? Some studies show as many as 80% of students use this method as their primary mode of studying and it also happens to be one of the most ineffective ways to study! For a while now I’ve had an interest in memory techniques and the efficiency of learning. Lately, I’ve become somewhat obsessed! 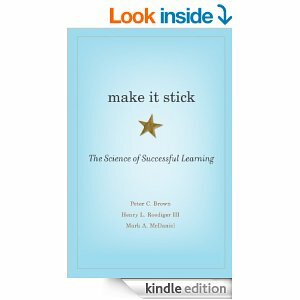 If I were to recommend one book to everyone, it would be Make it Stick: The Science of Successful Learning by Peter C. Brown, Henry L. Roediger III, and Mark A McDaniel. The book has some phenomenal information regarding learning and is helpful to people of all ages. It was the source of the introductory information regarding highlighting as well. Apparently, highlighting is not only time-consuming and ineffective, it also creates a false sense of knowing the material since you familiarize yourself with the words. Instead, you should force yourself to recall the information without reading it again (flashcards, creating outlines from memory, etc.). Obviously, you can’t always remember everything and will need to go back to review certain material. However, the stuff you do remember will “stick” better if more effort is required to recall it. This is just the tip of the iceberg in regards to helpful information in the above book, so like I said, you should definitely check it out. Most of the books I’ve been reading lately deal with the science behind effective learning, speed reading, memory palaces, mnemonics, etc. and I honestly can’t get enough. In the coming weeks I should definitely have some update recommendations. I’m currently even enrolled in an online course that teaches speed reading, and I have high hopes for it. I generally read at about 300 WPM with 80% retention and have a goal of 500 WPM within the next couple months while keeping retention at 80-90%. I’ll be sure to keep everyone updated and recommend the course if it works out! However, it’s the last few weeks of the semester for medical school as well, so hopefully I’ll be able to keep up with everything!